We are India's Most trusted manufacturer and Suppliers of Steel Fasteners in Excellent Quality with low Prizes. 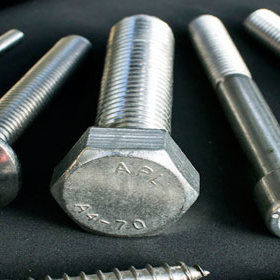 We are the leading manufacturer and suppliers for 304 Stainless Still Bolts in India We also provide Steel Bolts, Custom provide bolts, Anchor Bolts, Lag Bolts, Shoulder Bolts in Excellent Quality with low Prizes. Steel Tubes India are the leading manufacturer of high integrity Stainless Steel 304 Fasteners (e.g.screw,stud-bolt,nuts-bolts,nuts and washers meeting clients exacting demands for critical applications in hostile environments. Whether for offshore (buoyancy and petrochemical), seawater, pump, valve or nuclear, the demands for an exceptional service and supply is never ending. We believe manufacturing bolting in exotic materials is an art form and it is something we have perfected at Steel Tubes India. 304 Bolts and Supplier. Our Stainless Steel 304 Fasteners product range includes Stainless Steel Bolts, Hexagon head bolt, Hexagon head screw, Round head square neck bolt, Hexagon socket head cap screw in full thread and half thread, Hexagon wood screw, Hexagon socket button head screw, Hexagon socket button flange screw, Hexagon socket counter sunk head cap screw in full thread and half thread, square nuts, square weld nuts, hexagon weld nuts, thick nyloc nuts, hexagon flange nuts, threaded rods, dowel Plain / Flat Washer, Spring Washers, Countersunk Washer,Tooth Lock Washer and many more. We provide products as per standards.